By 1986, Duran Duran had achieved international superstardom, then embarrassed themselves to the edge of irrelevance. Plus, they were down to one Taylor. How could they possibly survive? Did MTV make Duran Duran or did Duran Duran make MTV? In 1986, that question was moot, because the two were inextricably linked. With the help of those groundbreaking, escapist videos and some good tunes, the band had by 1982 become a global juggernaut. The rub was that the more screaming teenagers showed up at their shows, the more their critical acclaim and respect slipped. With Seven and the Ragged Tiger in 1983, Duran Duran were starting to confuse those videos with real life. In came the supermodel arm candy, the ego-stroking side projects, the drugs, the general hedonism. By the end of 1985, Duran Duran had all but imploded. Clearly, if Duran Duran was to continue, a rethink was badly needed. The band emerged from the morass having lost drummer Roger Taylor, never a "Wild Boy", to early retirement. Guitarist Andy Taylor had to be forced into the studio through legal means, but things went so badly he was soon let go. That left the trio of vocalist Simon LeBon, keyboardist Nick Rhodes, and bassist John Taylor to embark on the second stage of Duran Duran's career. Commercially, it was less successful than the first, but that was almost inevitable given the extent to which the band had worn out their "Fab Five" welcome. Artistically, Notorious and Big Thing have for 20-plus years been all-but-dismissed by everyone outside Duran Duran's core fanbase, a situation these long-delayed deluxe reissues are meant to remedy. And, while certainly no lost classics, the albums hold up better than you probably remember, the sound of a band trying desperately to survive, and succeeding, albeit barely. With Andy Taylor's rock-god hard rock leanings aside, Duran Duran were left to pursue the more arty, sophisticated direction co-founders Rhodes and John Taylor had always envisioned. They brought in one of their heroes, ex-Chic guitarist Nile Rodgers, to co-produce. And, as far as "mature" makeovers go, Notorious fit the bill. A surprisingly homogenous album, it finds the band ditching the flash in favor of a balanced, cocktail-funk approach. It's dominated by Taylor's still-exemplary bass playing and session man (and current Heartbreaker) Steve Ferrone's smooth, soulful drumming, some of the best you'll ever hear on a pop record. As he had with David Bowie's Let's Dance a few years earlier, Rodgers summons a speaker-filling gated drum sound that dominates all in its path. It works, providing a nice backdrop for LeBon's distinctive voice, Rhodes' straightforward keyboard parts, and a prominent brass section. The songwriting isn't always as consistent as the production. Singles "Notorious" and "Skin Trade" are arguably among the best Duran Duran have ever released, putting familiar appeals to fame and sexuality in a new, genuinely funky context. A few other tracks work well, notably the slinky "American Science" and triumphant "Proposition", while the chilly ballad "Winter Marches On", with no low end at all, is a much-needed change of pace. It also showcases Duran Duran's, and Rhodes' in particular, underrated ability to summon a satisfyingly ethereal atmosphere. Other tracks, though, suffer from lack of distinction. 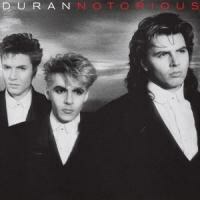 Duran Duran always struggled to supplement their singles with strong album material, and Notorious does at times reveal the stress and tension of the period in unflattering ways. Still, it's a Duran Duran album the kids could dance to, but the grown-ups didn't have to be embarrassed about liking, either. It's more than a little strange that having handled such a dicey transition better than expected, Duran Duran would only then slip into a major identity crisis. From its weak day-glo cover art to the music within, Big Thing is Duran Duran trying much harder than necessary to up both their commercial and critical standing. They do this by dividing the album into a "dance" side and an "art" side, and the juxtaposition reveals the band's lack of confidence. Once again, the singles are the high points. "I Don't Want Your Love" is a more electronic, sleazy take on the funk of "Notorious", while "All She Wants Is" turns that sound into a bona-fide house track. The melancholy, genuinely touching "Do You Believe in Shame", probably Duran Duran's most underrated single, kicks off a suite of moody, thoughtful ballads. This amounts to a slightly more middle-of-the-road, but still welcome, version of the Rio period's mix of navel-gazing and tunefulness. 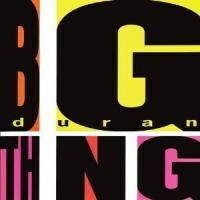 The second half of Big Thing still stands as one of Duran Duran's most consistent, focused moments. Paradoxically, though, it doesn't really feel that way. Maybe it's the aftertaste of all the bet-hedging on Side A, but something's not quite right, and what could have been a defining artistic statement comes off as more of a happy accident. Duran Duran's crisis of confidence becomes painfully clear when you contrast the live shows that come with each album's respective DVD. The 1986 show finds the band still swaggering along like more polished versions of their 1984 selves, with new guitarist Warren Cuccurullo doing enough rock-god posturing for three Andy Taylors. Still, the show is classy and impressive, even if the brass section detracts from some of the old hits. You even get a nice acoustic version of "Save a Prayer". A couple years later, though, and LeBon looks like a pudgy hair-metal trainwreck, and the show fares little better. By the end, the Duran Duran have devolved into some kind of jazz-fusion jam band from hell. EMI did nothing to right its image as a desperate, out-of-tune dinosaur of a record company when it recently refused to correct admitted errors in the sound remastering of Duran Duran's self-titled debut. Fortunately, there are no such issues here. The sound is crisp and, in keeping with the times, too loud. Each album has its attendant remixes and b-sides appended, and Big Thing fares much better in this respect, with LeBon proving surprisingly engaging as a spoken-word artist. Notorious and Big Thing marked the beginning of a slugfest between Duran Duran and the popular consciousness that continues to this day. With these two albums, at least, they emerged less bloodied than expected.